Today is National What's on Your Plate Day, based on the U.S. Department of Agriculture's Choose My Plate program. 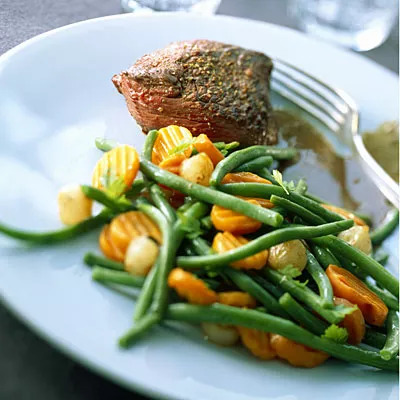 Of course you know what's on your plate, but is it the right healthy mix of food?The USDA outlines what--and how much food--you should be dishing up for optimal health. Today is National What's on Your Plate Day, based on the U.S. Department of Agriculture's Choose My Plate program. Of course you know what's on your plate, but is it the right healthy mix of food? The USDA outlines what--and how much food--you should be dishing up for optimal health. Fruits and veggies are good for your health, but this cheat sheet makes it easier to get the portion sizes right every day. Eat more red, orange, and dark-green veggies (think: tomatoes and broccoli), and use fruits as snacks, salads, or desserts. For someone eating 2,000 calories a day, the total for the day would be 2 ½ cups of veggies and 2 cups of fruit. Choose products with “whole grain” on the ingredient list if you can. So again for a 2000-calorie-a-day diet, you should eat 6 ounces of grains a day. One ounce is equal to one slice of bread, a half-cup of cooked rice, cereal, or pasta, or one ounce of ready-to-eat cereal. You can get creative and use difference sources of protein, like lentils, quinoa, beans, eggs, nuts, peas, seeds, as well as lean meat, poultry, or fish. Total for day: 5 ½ ounces. Choose healthier dairy products to provide the same amount of calcium for less fat and calories. Total for day: 3 cups. A useful tool is the USDA’s SuperTracker, which helps you plan and analyze your meals and physical activity, provides personalized nutrition plans, and offers tips and suggestions on how to make healthier choices. More information and a helpful plate chart can be found here.